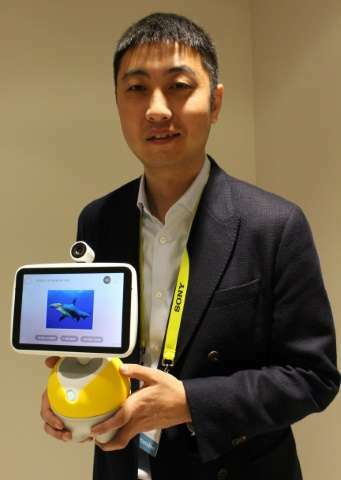 Chinese internet colossus Baidu is out to make a splash with 'Little Fish,' a family robot that is a voice-controlled virtual valet akin to Amazon Echo or Google Home. Baidu showed off "Little Fish," a translation of its Chinese name "Xiaoyu Zaijia," on Thursday at the Consumer Electronics Show in Las Vegas ahead of its release in China later this year. "I think 2017 will be the year of conversational computing," Baidu chief scientist Andrew Ng said while demonstrating Little Fish for AFP behind closed doors at the show. "We see a clear path of conversational computers changing everything." Using voice to interact with computers that are able to essentially learn from experience was among the hot trends at CES. Arrays of device makers added digital aide capabilities with the help of Amazon's Alexa or Google Assistant technology. Unlike "faceless" Amazon Alexa or Google Home devices that rely on people asking for information or controlling devices by speaking, Little Fish also features a touch-screen on top of its orb-shaped base. A camera on top tracks faces, and the screen swivels to keep facing a speaker. "Speech is the fastest way for you to communicate with a computer, but a screen is a very fast way for a machine to communicate back to you," Ng said. For example, it would be quicker to glance at a requested list of top restaurants from Yelp than it would be to listen to the computer read all the names and descriptions, he said. Little Fish uses Baidu's operating system DuerOS, which is already employed by other devices in China, such as set-top TV boxes that can switch channels by voice command or figure out names of actors on screen when asked. The bigger vision is to build DuerOS into a broad range of gadgets that tap into Baidu's internet capabilities for search, food delivery, online commerce and more. "If this takes off, I am not worried about how we will make money," Ng said when asked about revenue plans. "It will transform how you use devices in your home. There are plenty of business models." 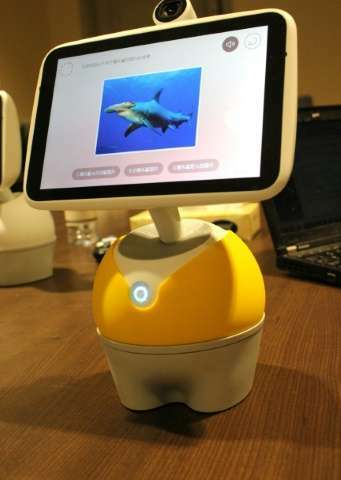 Little Fish, a second-generation device, will be released in China at a price yet to be disclosed, according to Baidu. Baidu partnered with hardware firm Ainemo to build it. "We believe family robots will be the next big category that will be a member of everybody's home," Ainemo chief executive and founder Chenfeng Song said in a release. Artificial intelligence, or AI, is getting a foothold in homes, with developers feverishly adding "skills" to Amazon Echo speakers infused with Alexa. Google, meanwhile, is using its AI prowess in Android smartphones, messaging software, and a vase-sized Home digital assistant. The home hubs, sometimes referred to as smart speakers, fetch content or answers from the internet, and can act as remote controls for other devices in houses. "We are moving technologies beyond the smartphone," said Shawn DuBravac, chief economist at the Consumer Technology Association (CTA) that organizes CES. "Ultimately, vocal computing is replacing the (screen)." 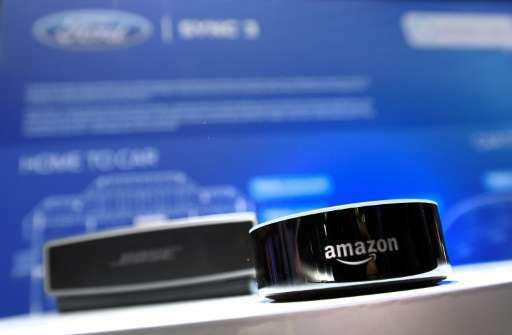 Chinese tech giant Huawei said at CES that it is adding Amazon's Alexa to its flagship smartphone for its US launch. China-based Lenovo announced it was launching a smart home assistant powered by Alexa, joining the growing roster of contenders in the market for voice-activated devices. "In the smart home, voice is clearly important," DuBravac said. "We are seeing that play out at CES." He expected voice technology to quickly improve, within years perhaps even being able to recognize speakers so accurately it could be used for biometric security, or simple parental override of internet use by offspring. "I know that in my home with my boys, I would like Alexa to recognize my voice as the ruler of the coop," DuBravac quipped. While digital assistant technology is being built into televisions, appliances and more, hub devices such as Alexa will be key to voice-controlled computing, according to the economist. NPD analyst Ben Arnold said at CES that he is "bullish on everything voice and AI," with the technologies eventually "pollenating" devices so thoroughly they essentially become home operating systems.